You can learn a lot about a movie from it's costumes. This is especially true with science fiction, I think. The notion of what people will wear in space or in the future tells a lot about the culture that spawned a film. 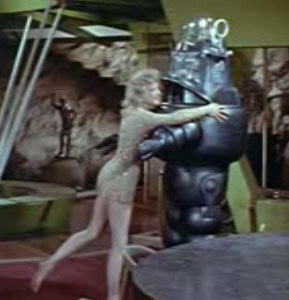 Here's a look at some of my favorite costumes from Forbidden Planet (1956). Keep in mind that Robby the Robot is supposed to have made all of the clothes worn by Dr. Morbius and his daughter, Alta. One of the best things about this movie are the Space Navy costumes worn by the men. They look a little bit space, a little bit navy and they give everyone nice big shoulders. As Betty Davis and Joan Crawford might attest, everyone could use a little help in the shoulder department. 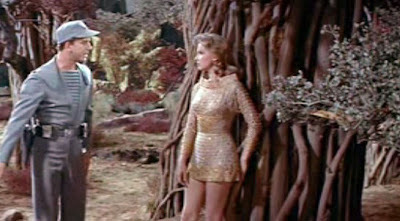 No sooner is Alta introduced, than her costume causes problems for the space men who've come to investigate her father. Dopey looks quickly progress to kissing lessons. Though Dr. Mobious is jealous of any attention given to Alta by the starry sailors, he has yet to have the "you're not leaving the house dressed like that, young lady," talk with her. Her "statement necklace" is genuine ruby, synthesized by Robby. Since Dr. Morbius has failed teach Alta the facts about sailors, Commander Adams tries explaining that men who've been "locked up in hyperspace" for more than a year can't necessarily remain gentleman with her short skirts and free lip locks. He gets all bitchy and it's pretty clear he's feeling the pressure too. I love this dress with it's boat neck, funnel collar and texture reminiscent of coins welded to fabric. Taking his lecture to heart, Alta tones down her look for her next meeting with the Commander. Some of her good intentions are lost when she precedes the big reveal with a naked swim. It's so hard to explain cultural mores to space girls. Another of Robby's amazing necklaces accessorizes this Grecian inspired gown. Alta wears this black satin number with off center silver sequins for a few minutes while she stands around in the background. As near as I can tell the movie takes place over three days, which gives Alta a number of costume changes approaching the Kay Francis level. Not to be left out, Dr. Morbius relaxes in this black kimono or Man Dress. The sumptuous black on black ensemble is just the thing to wear to meet your Id monster. This is my favorite of Alta's many ensembles. It's a travel dress, but you have to think she had Robby whip it up, taking style cues from the Space Navy uniforms. I love the collar and hood, the structured box sleeves and the button details on the waist. Don't forget to hug your robot! great post! thanks so much for making me understand how cool even the clothing in this film are! I was already a huge fan of the film itself. Lavish MGM production design through and through! Great post! The nautical outfit is very cute! It's good to know we'll still be wearing nautical-inspired things in the future. I'm also going to start with 'great post!' I love the costumes in this movie. They're fantastic. Rupert: I love MGM production values. It's no accident that this is the sci fi movie I choose as the poster boy for my anti-Avatar campaign. If you're gonna go in for spectacle sci fi, be prepared for it to be gloriously ridiculous in a few decades. If Avatar wins the Oscar it's gonna be as if Forbidden Planet won the Oscar for BP. Sally: It wouldn't be worth living in a world without ladyish sailor clothes, would it? Andi: I've been in such a thirties rut lately, not just with movies, but with vintage as well. This movie made me love the New Look all over again.